The proposed bill, labeled the United States Appreciation for Olympians and Paralympians Act, would retroactively apply to the 2016 games in Rio De Janeiro, Brazil. 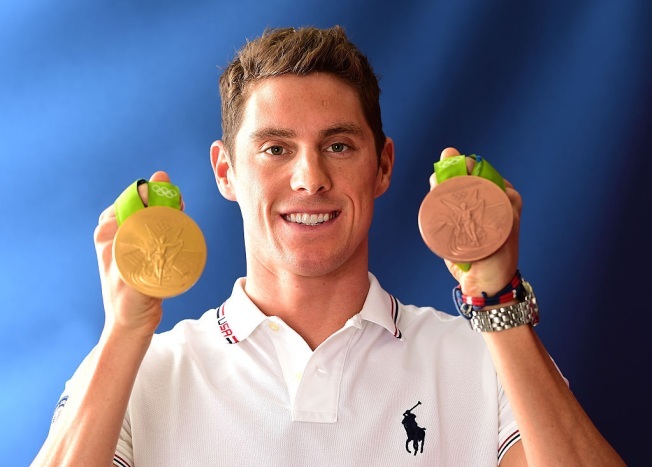 Swimmer Conor Dwyer of the United States poses for a photo with his bronze and gold medals on the Today show set on Copacabana Beach on August 10, 2016 in Rio de Janeiro, Brazil. U.S. Rep. Robert Dold, R-Ill., proposed legislation Monday that would abolish a tax imposed on medals and other prizes won by Olympic and Paralympic athletes, the congressman’s office announced in a news release. “Our Olympic and Paralympic athletes make numerous personal sacrifices while training to represent the United States on the global stage,” Dold said in the statement. “But when they return home with a medal for Team USA, the IRS forces the athletes to pay a penalty for their success. According to USA Today, Olympics athletes earn cash for each win from the United States Olympic Committee: $25,000 for gold, $15,000 for silver and $10,000 for a bronze medal — income that's considered taxable. Athletes who rank among the highest earners will end up shelling out a maximum "victory tax" of $9,900 for each gold when using the top tax rate of 39.6 percent. Silver and bronze medalists at that rate will pay $5,940 and $3,960 each. Athletes who fall in a lower tax bracket will pay less. The medals are also taxed based on current commodity prices. But their values are much lower than expected. The act, according to Dold's office, would “exempt the value” of awards given to Team USA Olympians by the United States Olympic Committee from their taxable income. It would have no impact on federal revenue or taxes on athletes’ sponsorship or endorsement income, the news release said. “Athletes from the United States work for years representing America in Olympic Games, often earning very little money, and then we tag them with a tax on the value of the medal they win. I think it’s time to change that,” Rep. Blake Farenthold said in the release. Sen. Marco Rubio, R-Fla., introduced a similary bill in Congress in 2012, but it failed. This year, Sens. John Thune, R-S.D., and Chuck Schumer D-N.Y., also sponsored a bill to get rid of taxes on Olympic and Paralymic athletes, which passed in July, according to CNBC. “This tax illustrates how complicated and burdensome the tax code is. While we need to make it more fair and less burdensome for all, I think this is a good way to start," Farenthold said. "Congressman Dold and I intend to fix it."